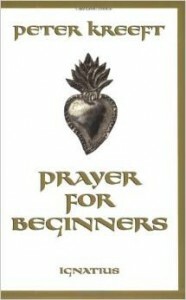 In the last few weeks, I’ve experienced a truly amazing grace in my prayer life, and it stems from an efficient little book I stumbled upon several years ago called Prayer for Beginners by Peter Kreeft. The first time I saw the book was during a silent retreat back in 2006, during a similar time when my prayer felt dry and ineffective. I knew God was listening, but it didn’t feel like He was. I managed to read the entire book during the retreat, but one section stood out in particular. Unfortunately, as is often the case after a retreat, I forgot 95% of the lessons I learned as the reality of life took over once again. Then just a couple weeks ago, for no apparent reason, Kreeft’s simplified lesson for prayer popped back into my head. It started with an acronym that worked as an outline for how to approach God in prayer. The acronym stands for Repentance, Adoration, Petition, and Thanksgiving. On a fluke, after all these years I decided to try it a few times, starting privately, and then explaining it to my children, and then even sharing it with co-workers. But even with it’s simplicity, I find that explaining the acronym is still confusing, but when you actually model the praying technique, people are amazed! So below I want to briefly explain how I have implemented those 4 steps, and provide an example of how you might use this is in your own prayer life. This has been one of my favorite aspects of the prayer. I’m the kind of person that wants to rip off the Band-Aid quickly, so jumping right to acknowledging my own stupidity and inadequacies has been enormously beneficial. When I use this method every day, this acts as a reminder for a daily examination of conscience. What have I done (or thought or failed to do) in the last 24 hours? I simply recall all of these things, summon up true contrition, and bring these things to God in prayer. I’ll still bring these to Confession at a later date, but a daily examination of conscience allows me to allow true contrition to keep me in alignment with the will of God. For this part of the prayer, I take a moment to slow down and acknowledge the sovereignty of God. I stop and think about God the Father, the creator of heaven and earth. I think of Him truly as my father, and I put myself in His presence, approaching Him as His child. He cares about me. He loves me. He wants to hear from me. I then acknowledge Jesus Christ, my brother and my king, who loves me so much He allowed Himself to be put on the cross and killed for me. And I think about my love for Him. Lastly, I think about the power of the Holy Spirit in my life, and how dependent I am on Him and the graces He delivers into my soul through the Sacraments. I love that before I start asking God for stuff, and tossing a litany of wants and needs at Him, that I’ve taken the time to apologize and acknowledge Him as the One in control. Having done so, I’ve actually found that my petitions are harder to formulate, because I’m more cognizant of my own failures, as well as how much better God is than me at determining true needs. I’ve also found this method makes it easier and more natural to pray for others, because I’ve already removed myself as the center of prayer. Consciously taking time to be thankful has made a huge difference. Just as in repenting, with this last step I stop and think about all the ways in the past 24 hours that God has been there for me. All the small ways (like getting me home without bad traffic) or the big ways (good health reports or answers to past prayers). I try to think of every single good thing that God has done in my life since the last time I prayed this RAPT prayer, and the peace upon completing it is undeniably evident. You can make this prayer last as long as you want, but can also pray it in just a minute or two. With your family, I recommend pausing after each step, allowing each person to silently ponder these things in his or her heart. [R-Repentance] I am sorry for not taking more time to talk with you yesterday, and for allowing the busy-ness of the day to take over. I’m sorry for yelling at my kid, and for being so angry inside afterward and for not immediately showing forgiveness. [A-Adoration] You are God my Father, who made me and everything around me. Everything in my life is a gift from You. You are Jesus Christ my savior who loves me so much You died for me. You are God the Holy Spirit, the shared love of Father for the Son and Son for the Father, who inspires and directs me in my life. [P-Petition] I ask you to help me be a better father. Please help me understand how best to be like You. Please help the people in my life who are suffering. [T-Thanksgiving] Lord, I am so thankful for the fact that You hear my prayers. I thank you for the way things have been going at work, and I thank you for the ways you’ve been blessing my family, and for keeping us healthy and safe. I thank you for being my God, and I offer up my day – both the good and the bad — to You. I love you, Lord. Thank you for everything. Amen. After you’ve tried this, leave a comment below to let me know it worked for you! Around the table, everyone nodded in agreement with the hypothesis that, even though the phrase is frequently used in the Catholic Church—and despite the fact that Pope Benedict XVI declared a Year of Faith with a focus on the New Evangelization between October 2012 and November 2013—many people don’t have a clue as to what “new evangelization” is, what their role in it is, or how to make it a part of their daily lives. Sadly, this seems to be the case even after three decades of discussion on the topic. What’s the first thing you think of when you hear the phrase “new evangelization”? There are many different ideas of what the new evangelization is and isn’t. You might think it has something to do with improving religious education, or perhaps it has to do with new media, podcasts, blogs, and social networks. Or maybe you simply think the new evangelization is about a whole new way of sharing the Faith. The fact of the matter is that the new evangelization includes each of these approaches, and many more. With so many possibilities, coming up with a concise definition for such an important topic might cause additional trepidation for someone who is already apprehensive about any form of evangelization, new or old. Simply put, the new evangelization is all about Jesus Christ and living out the faith that draws us closer to him. It’s about your relationship with Christ, as well as helping others to continually develop a relationship with him, too. But it’s also about the many approaches available to do so, and the fervor with which we embrace this challenge in today’s secular and relativistic culture. That’s why I say that defining the new evangelization is like herding squirrels: It can take you in a multitude of different directions, sometimes all at once. It’s difficult to find someone in today’s world who has not at least heard of Jesus Christ. That’s because the initial, first, and primary evangelization that started with the apostles has accomplished what Jesus instructed them to do, which was to be witnesses to the ends of the earth (Acts 1:8). The new evangelization can be considered a secondary follow-up to the first evangelization that introduced the world to the salvific message of Jesus Christ. It is meant not only for those without any relationship with Christ, but also for those who have been introduced to Jesus, but who, for one reason or another, have not developed or maintained a relationship with him. Likewise, the new evangelization is an ongoing effort that applies to you, me, your priest, the pope—everyone who currently doeshave a relationship with Christ. An easy way to think about the new evangelization is to break it down into three parts: know the Faith, live the Faith, and share the Faith. For the new evangelization to work, it is necessary for each of us as Catholics to engage in all three areas and do so on a constant, unending basis. The new evangelization is a challenge to continually grow in our relationship with Jesus and to help others do the same. This starts with knowing our Faith. When giving talks to groups, I regularly remind people that from the moment we are conceived, we are 2,000 years behind the curve when it comes to learning about the history, traditions, and sacramental life of the Catholic Church. We’ve got a lot of catching up to do! We can (and should) spend our entire lives on an unending quest of knowing as much about our Faith as possible. Our hunger for the truth should drive us to question our misunderstandings and incomplete knowledge and seek out answers that the Church readily provides. And if you’re like me, growing up in the 1970s and 80s, perhaps the catechesis you did receive did not provide a truly firm foundational understanding of the core tenets of Catholicism—such as the Church’s teaching on the Real Presence of Jesus Christ in the Eucharist, for example. But if we stop at just knowing the Faith without living it out, then we’re just talking the talk and not walking the walk. I know many people who can quote the Bible, chapter and verse, but do a miserable job actually acting in the way that Christ commands. Therefore, the second aspect of the new evangelization is living the Faith through regular reception of the sacraments (especially the Eucharist and reconciliation), as well as striving to be Christ to others in this world. It is finding ways each day to actually implement the teachings of the Faith through our thoughts, words, and actions. Lastly, if we just know and live out our faith without sharing it with others, we are not living out our faith with the zeal of the first apostles. To truly be new evangelizers, it is not enough to just focus on one of these areas. It is absolutely mandatory that we strive to grow in all three. Knowing that the new evangelization is something that applies to each and every Christian, how will you make it a part of your life? I suggest taking small, incremental, ongoing steps combined with a concrete game plan. A week from now, what realistic steps will you have taken to better know your Faith? A month from now, what are some tangible ways will you be more fully living out your Faith? A year from now, what would it look like for you to more successfully share your Faith with others? Writing down realistic goals and action steps ultimately has a snowball effect on how we know, live, and share our Faith. Though it may seem we’re only making minor improvements each day, week, month, and year, over time our incremental efforts build upon each other, making our Faith more exciting, engaging, and life-altering. What’s your game plan? Given how basic the new evangelization truly is, what steps will you take to become a new evangelizer? Pick one short book from the Bible (like James or Mark) and read it all the way through. Learn more about the Eucharist by reading, studying, and praying over John 6 (especially the Bread of Life discourse). Learn to use the Index of Citations in the back of the Catechism to learn what the Catholic Church teaches about individual passages of Scripture. Read Humanae Vitae by Pope Paul VI. Watch episodes of That Catholic Show at NewEvangelizers.com. Visit USCCB.org and read the bishops’ document, Disciples Called to Witness. Ask the Holy Spirit for wisdom. Read the Catechism’s explanation of the Nicene Creed to better understand the words we recite at Mass. Brush up on the Ten Commandments. Start bringing your Bible to Mass with you, and write notes in the margins during the homily. Clean out your closet and find at least five items to donate or give away. Go sit in front of the tabernacle and tell Jesus you love him. Increase your tithe at least 1 percent, if not more. Pray for others, especially people you don’t like. Rest on Sundays. Turn off electronics. Focus on God and family. Keep a crucifix next to your computer. Vote as a Catholic—not as a Republican, Democrat, Conservative, or Liberal. Anonymously give cash to someone in need. Hang a holy card in your office at work or on your refrigerator. Start a blog and write about your faith journey. Invite someone to Adoration, especially your kids or spouse. Forgive someone who hurt you. Buy Catholic newspaper and magazine subscriptions (like Catholic Digest) for other people. Eat dinner as a family and always start with a prayer. Offer to teach a class or get involved in other ministries in your parish. Wear Catholic T-shirts in public. Use Twitter, Facebook, or other social media to share your favorite verse from Mass each week. Make sure every person in your family has a Bible and rosary and offer to help them learn how to use them. *Like this list of ideas? For an entire year of ideas for knowing, living, and sharing your Faith, pick up a copy of The New Evangelization and You: Be Not Afraid. This article originally appeared in Catholic Digest.